A kitchy vintage tiki bar that opened up in 1956. This is not a hipster craft cocktail den, but a throwback to a different era. A time when Polynesian-themed restaurants were a fancy night out. "Authentic recipes that have been passed along since they opened in the mid-50s. They have a private rum collection in the back room, like pre-Castro Havana Club. It has gardens outside that are like a little maze." "This is the number one tiki mecca. It opened up in 1958 and it cost nearly a million dollars, which made it the most expensive restaurant ever to open at that time. It still has all the original décor. They do a nightly Polynesian show. The bar is fascinating because there’s no shaking cocktails going on in front of the customers. You just see a lovely girl with way too few clothes on delivering cocktails to your table. "It’s probably the most important tiki bar and an immense food and drink empire." Located on the lower level of the Hilton Atlanta, come for the Mai Tai and stay for the Crab Rangoon. "This is a beautiful and quite old 1970s era tiki bar and restaurant." This is mecca for Tiki lovers and one of the most famous of its kind in the country. Bartender Ray Buhen opened the small joint in 1961 and his sons and grandsons are carrying on the tradition mixing his full repertoire of 86 different drinks. "They have incredible Tiki drinks. It’s really small with about twelve seats at the bar and maybe four tables. They have all the recipes from the original Don the Beachcomber and they know how these drinks were actually made." "It’s been here since 1961 and it’s a must visit. It’s family-run for 3 generations and the founder of it, Ray Buhen, was one of Don the Beachcomber’s first bartenders at the birth of tiki. It’s basically a direct descendant." "It’s been continuously operated by Ray Buhen's family and they the cheapest ingredients and make magic with it. You can just feel the history in the walls. Mind you, some of that history is just layers of nicotine covered with layers of shellack but, you know." The Los Angeles location opened in 1958 and they are serving iconic cocktails like the Blue Hawaiian, the Mai Tai, and the 1934 Zombie. "Their first location is in Hollywood and it’s been around since the 1950s. It’s a little tiny hole in the wall, but it’s really neat. They don’t have a lot of the original décor, because it just kind of fell down into a dive bar and then it was, ‘Oh wait let’s do a tiki bar.’ They revitalized it a little bit a few years ago. The owner has had such success with it that she decided to open a Tonga Hut in Palm Springs." "This is the oldest continuously operating tiki bar in Southern California. New owners have fixed up the old fountains and done really beautiful period and stylistically appropriate remodeling. The drinks are classic tiki cocktails made with fresh juices. It is a real slice of classic LA tiki but polished up." "It’s a great small tiki bar and restaurant, but built with Disney dollars. Don’t miss the ship in the bottle that actually sinks or the volcano eruption in the windows." "There are little touches of magic all over the place. There are carved tikis at the end of the bar and if you keep looking at them eventually one of the tiki’s eyes will start to move. The Krakatoa is just a lovely drink and it comes with a little plastic ice cube on the bottom that glows while you’re drinking it. The bartender presses a button and all of a sudden all the lights dim, then they come back red, and you hear this volcano exploding. This lovely scenic painting of a hill on a sea side suddenly turns into this nightmarish volcano. It’s incredible." Featuring 200 bottles rum and over 70 cocktails harkening back to Prohibition-era Havana. Waterfall, wood planks, and three floors of bars. The top half-level is a tiki hut overlooking the main floor. "Martin Cate (who started the bar) is a phenomenal mixologist and he's doing all sorts of great things with the concept of tiki drinks. He knows the classics and has created drinks that are really extraordinary." "This is America’s foremost rum bar. They regularly have over 400 rums rotating in their selection. The drink menu is 72 cocktails, ranging from the Colonial era to Cuban style drinks like a daiquiri, a mojito and then into tropical and even some new originals that owner Martin Cate has created." A new version of an old Tiki bar. Started by mixologist Martin Cate (Smuggler's Cove), this fantasy island motif cocktail den has all the requirements - bamboo decor, Crab Rangoon and big batch Mai Tais. "It’s like a 1950s tiki bar with a little waterfall. You expect to walk in and hear bird calls like you’re in the middle of Tahiti." Overlooking the San Francisco Bay, with tropical decor, tiki cocktails and Polynesian food like Crab Rangoon, BBQ Spare Ribs and Bongo Bongo soup. 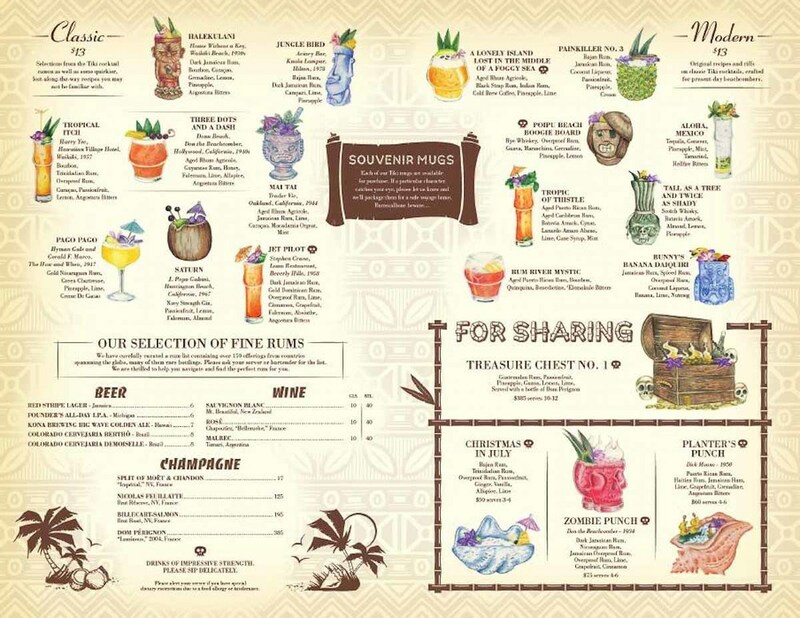 "Historically Trader Vic’s in Emeryville, California is terrific. Most of the décor from the original Oakland location is in it. It’s much larger than the original and it has a great setting right on the yacht harbor, so it’s on the water and there are bobbing sailboats outside. It just has a terrific feel to it with new pieces added to the old pieces." "Terrific food and drinks and a great atmosphere with a sunken bar. Very appropriate music. Special effects with thunderstorms and water features." "Blair Reynolds is bringing the Tiki renaissance to our little haven - complete with embedded mythologies, a coveted r(h)um collection, and thundering waterfall on entry. Tiki is nothing without the spirit behind the culture, and no one embraces that in the Pacific Northwest with the same gusto." 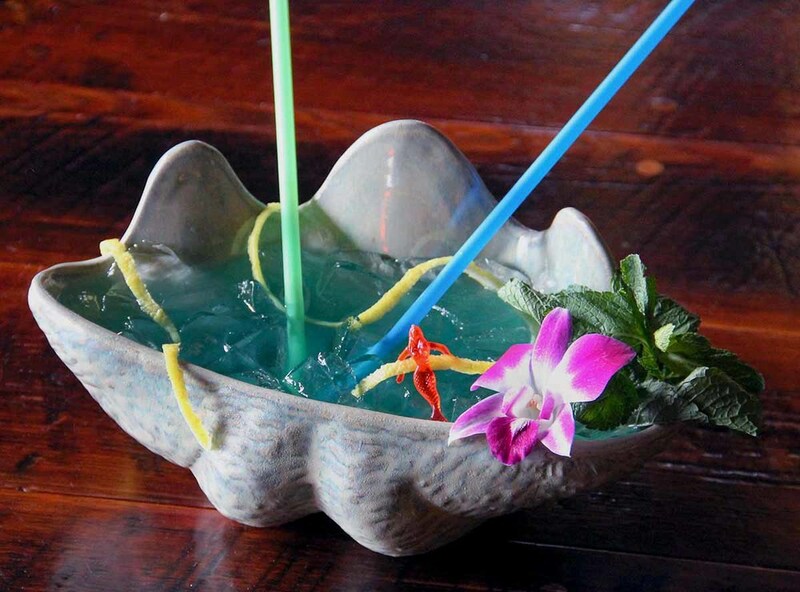 "This tiki bar was opened by Jason Alexander who has a big passion for crazy garnish. He brings a lot of creativity into his bar. He'll find new rums and create original drinks based on classic drink formulas, but with all new ingredients." In the land of kitsch, it’s no surprise to find a tiki bar. 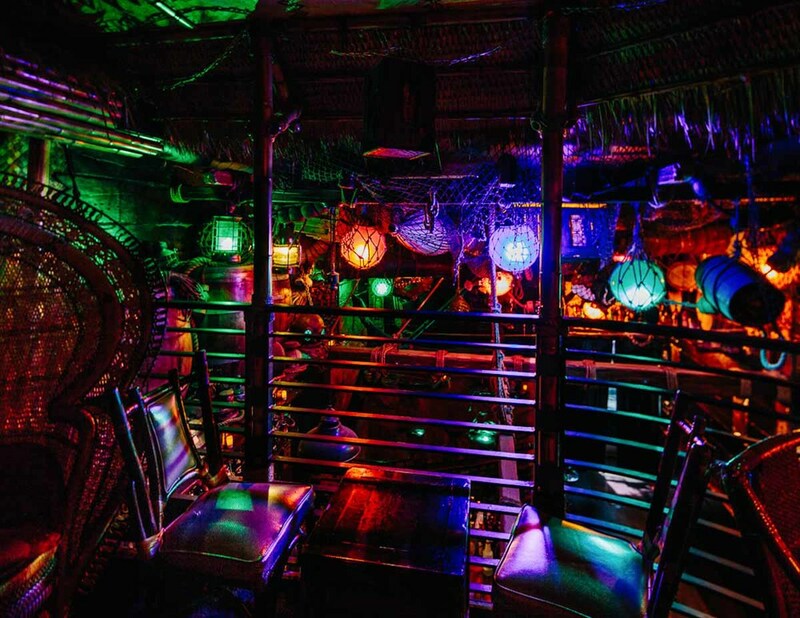 The interior was built by the grandson of one of the world's foremost tiki bar designers, Eli Hedley. There are original carvings by Tiki Bosko, who created art for the Tropicana. "They revamped an old night club. It’s north of the Fremont Street in downtown Vegas, but just a little bit further north, right off a highway that goes through Las Vegas. It’s not on the strip. The drinks are really good here." Step away from the Windy City right into Polynesia at this tropical tiki bar with a thatched roof bar, bamboo stools, and iconic tiki mugs. "It’s remarkable. There’s so much terrific custom glassware, outstanding garnishes, almost everything in a custom tiki mug, lots of swizzle sticks. Paul McGee has a terrific feel for cocktails. His balance is impeccable." "This is a bit more of a modern take on tiki by Paul McGee and it is gorgeous. They use all the best and freshest ingredients. The bar is custom built, flecked with gold with a tiki on either side. They have all their own custom mugs and do really interesting drinks." Opened by tiki guru Jeff ‘Beachbum’ Berry, who has authored six books on vintage tiki drinks and cuisine. Taste the drinks that were essentially lost until he unearthed them. "One of the best classic tiki bars in the country founded by the top tiki historian Jeff Berry." Bartender and creator of Smuggler’s Cove in San Francisco. Cate is a certified IBA Spirits Professional and member of the United States Bartenders Guild. Bartender and owner of Hale Pele in Portland, Oregon and creator of B. G. Reynolds Hand-Crafted Syrups for tropical bartending. 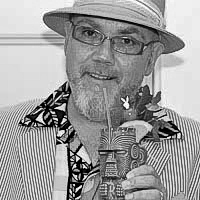 Reynolds is a tiki drink aficionado and blogs on tiki drinks and culture. Credited as the godfather of Boston's cocktail revival and nicknamed The Oracle of Tiki, you can catch him around Boston and New York mixing tropical concoctions. Bartender and beverage director at Compère Lapin in New Orleans. He was Diageo’s first-ever World Class U.S. Ambassador.